2017 Lowe SF214 Sport Fish Satisfy your need for relaxation and for fishing action, all with one mid-sized, right-priced pontoon: the Lowe Sport Fish 214. Expert Lowe construction and loads of amenities ensure top quality at a great valueso you can stay focused on having fun. The SF 214 is designed to be tough on fish, and easy on your walletget into the best pontoon boat designed for serious fishing! Please note: This boat model may or may not be in-stock. A Nationally Advertised Price, if listed, may change without notice or include accessories not fully described herein. Please contact your local, authorized dealer for exact details on model availability and package pricing. 2014 Lowe SF214 Sport Fish Lowe SF214 Sport Fish with 40 ELPT FourStroke and trailer. This boat model may or may not be in-stock. Please contact your local, authorized dealer for more information A fishing machine that fits the whole family, the SF 214 is a mid-sized pontoon built with your fishing needs and wallet in mind. 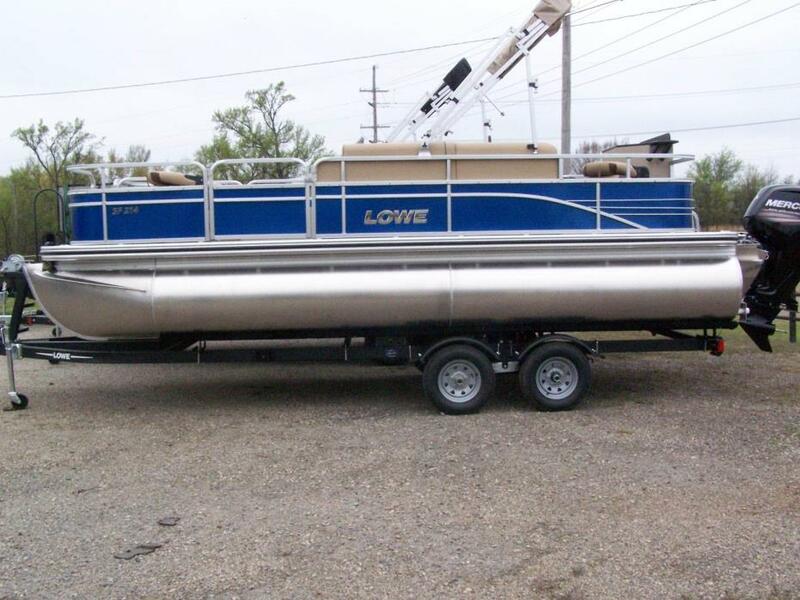 Invite the whole family to climb aboard with this fully equipped fishing pontoon featuring 4 pedestal fishing seats, a built-in tackle box, vertical rod-holders, a 13-gallon aerated livewell and a generous bow rod locker. You can tell the fishing buddies to come along, too—the SF 214 has a capacity for 11 passengers and their gear. And if riders are chasing a relaxing afternoon instead of fish, the SF 214 offers a comfortable “L” lounge, a premium Fusion® Marine stereo for your own soundtrack and convenient coverage from the sun with a 9-foot Bimini top. True to the Lowe tradition of quality for great value, large 25” pontoon logs with a full-length keel ensure maximum stability and agile handling so you can keep your mind on the fish.25” diameter high-buoyancy pontoon logs w/ full-width cross members and full keelCapacity for 11 family members or fishing buddiesFiberglass reinforced acrylic console w/ tach, speed, fuel & trim gaugesBarrel helm seat w/ swivel & slider4 pedestal fishing seats, bow and aftFusion® Marine AM/FM Stereo w/ MP3 plug-in & 6” speakers (2)13-gallon aerated livewell located in the bow area3 angled stern rod holders with cup holdersRound pedestal table w/ drink holdersAft entry w/ heavy-duty boarding ladderLarge 9' Bimini topOPTIONAL FISHING FEATURES: Fish station w/ livewell, MotorGuide® W55 wireless trolling motor, Lowrance X4 Pro fishfinder Lowe factory packaged boats are available with various horsepower Mercury® outboards. Standard equipment and options may vary from model to model. 2017 Lowe SF214 Sport Fish Satisfy your need for relaxation and for fishing action, all with one mid-sized, right-priced pontoon: the Lowe Sport Fish 214. Expert Lowe construction and loads of amenities ensure top quality at a great valueso you can stay focused on having fun. The SF 214 is designed to be tough on fish, and easy on your walletget into the best pontoon boat designed for serious fishing! Please note: This boat model may or may not be in-stock. A Nationally Advertised Price, if listed, may change without notice or include accessories not fully described herein. Please contact your local, authorized dealer for exact details on model availability and package pricing. ADDED OPTIONS: Ratchet tie downs, round table, fish station w/livewell, full cover, vinyl floor, stainless steel prop, and chrome package. 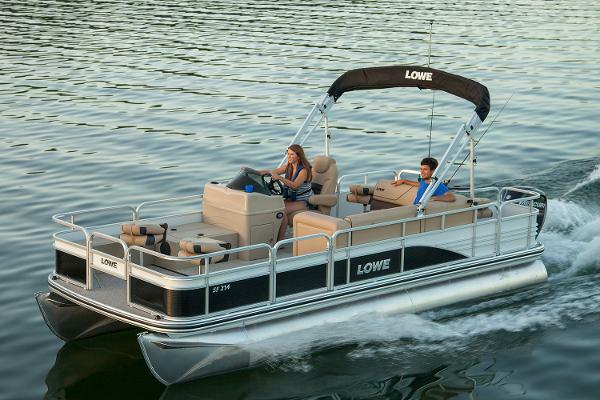 2016 Lowe SF214 Sport Fish Satisfy your need for relaxation and for fishing action, all with one mid-sized, right-priced pontoon: the Lowe Sport Fish 214. Expert Lowe construction and loads of amenities ensure top quality at a great value—so you can stay focused on having fun. The SF 214 is designed to be tough on fish, and easy on your wallet—get into the best pontoon boat designed for serious fishing! Please note: This boat model may or may not be in-stock. A Nationally Advertised Price, if listed, may change without notice or include accessories not fully described herein. Please contact your local, authorized dealer for exact details on model availability and package pricing. 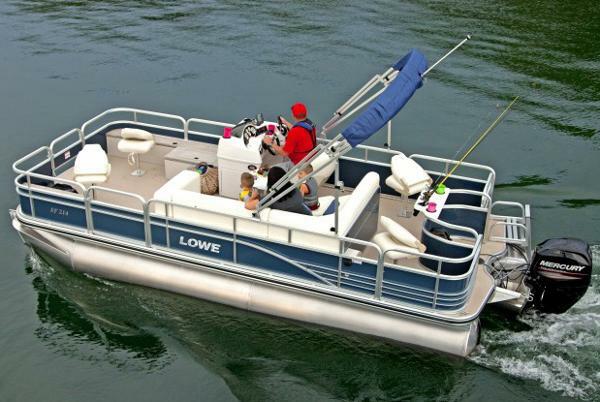 2015 Lowe SF214 Sport Fish Satisfy your need for relaxation and for fishing action, all with one mid-sized, right-priced pontoon: the Lowe SF214. Expert Lowe construction and loads of amenities ensure top quality at a great value—so you can keep your mind on the fish, not your wallet. 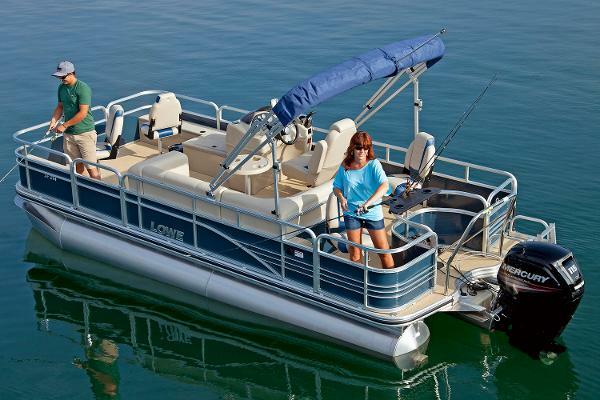 Features include: 25” diameter high-buoyancy pontoon logs w/ full-width cross members and full keelCapacity for 11 family members or fishing buddiesFiberglass reinforced acrylic console w/ tach, speed, fuel & trim gaugesBarrel helm seat w/ swivel & slider4 pedestal fishing seats, bow and aftJensen® MS30 Bluetooth-ready AM/FM stereo w/ speakers13-gallon aerated livewell located in the bow area3 angled stern rod holders with cup holdersRound pedestal table w/ 2 cup holdersStern entry w/ heavy-duty boarding ladderHeavy-duty 9' Bimini top in choice of 3 colors Options include: Changing Privacy Room Mercury Pre-rig Tilt Steering Custom Reclining Helm Seat All Round Table Bimini Top(Blue) Lowerance Mark 5X Depth Finder Mooring Cover 2-log Wavetamer Performance Lifting Strakes Front and Rear Vinyl Floor Chrome Package 60 HP Mercury Command Thrust Motor Trailer Tax, freight, documentation and prep not included in sale price. Dealer not responsible for errors. 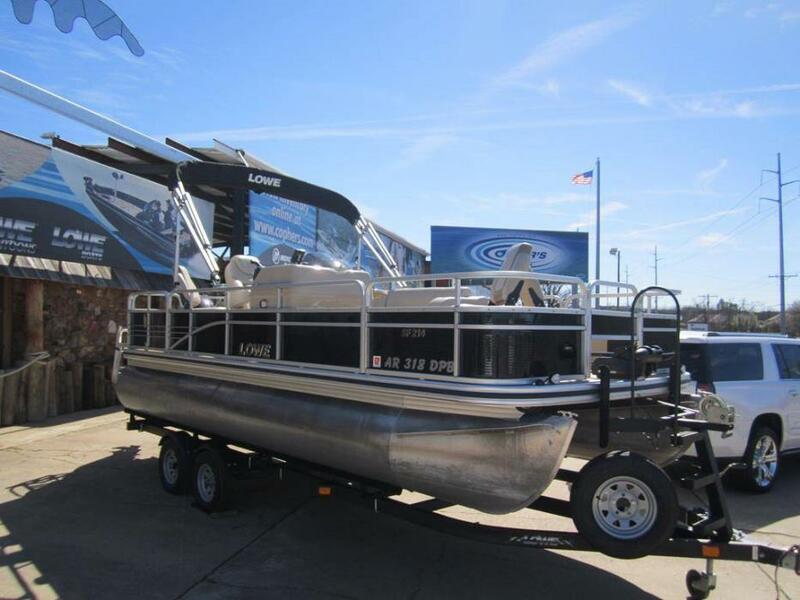 2016 Lowe SF214 Sport Fish Additional Options: Custom Reclining Helm Seat, Docking Lights, Hydraulic Steering, Custom Fit Snap On Cover, Pop Up Privacy Enclosure, Ski Tow Bar, Full Vinyl Flooring, XL Tritoon Package. Color- Blue Satisfy your need for relaxation and for fishing action, all with one mid-sized, right-priced pontoon: the Lowe SF214. Expert Lowe construction and loads of amenities ensure top quality at a great value—so you can keep your mind on the fish, not your wallet. Features include: 25” diameter high-buoyancy pontoon logs w/ full-width cross members and full keelCapacity for 11 family members or fishing buddiesFiberglass reinforced acrylic console w/ tach, speed, fuel & trim gaugesBarrel helm seat w/ swivel & slider4 pedestal fishing seats, bow and aftJensen® MS30 Bluetooth-ready AM/FM stereo w/ speakers13-gallon aerated livewell located in the bow area3 angled stern rod holders with cup holdersRound pedestal table w/ 2 cup holdersStern entry w/ heavy-duty boarding ladderHeavy-duty 9' Bimini top in choice of 3 colorsOPTIONAL FISHING FEATURES: Fish Station w/ livewell and optional ski tow; MotorGuide® or MinnKota™ trolling motor; Lowrance Elite or Mark-5x fishfinder Lowe factory packaged boats are available with various horsepower Mercury® outboards. Standard equipment and options may vary from model to model. 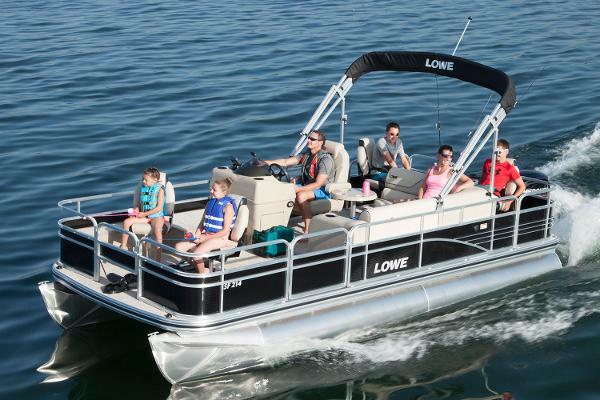 2017 Lowe SF214 Sport Fish Additional Options: Custom Reclining Helm Seat w/Slider, Docking Lights, Hydraulic Steering, Custom Fit Snap On Cover, Pop Up Privacy Enclosure, Ski Tow Bar, Full Vinyl Flooring, XL Tritoon Package. 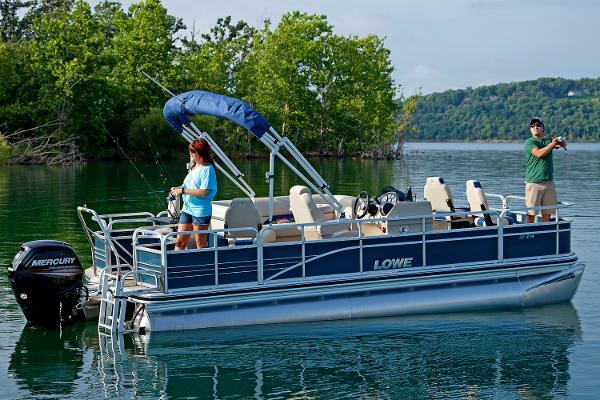 Color- Blue Satisfy your need for relaxation and for fishing action, all with one mid-sized, right-priced pontoon: the Lowe SF214. Expert Lowe construction and loads of amenities ensure top quality at a great value—so you can keep your mind on the fish, not your wallet. Features include: 25” diameter high-buoyancy pontoon logs w/ full-width cross members and full keelCapacity for 11 family members or fishing buddiesFiberglass reinforced acrylic console w/ tach, speed, fuel & trim gaugesBarrel helm seat w/ swivel & slider4 pedestal fishing seats, bow and aftJensen® MS30 Bluetooth-ready AM/FM stereo w/ speakers13-gallon aerated livewell located in the bow area3 angled stern rod holders with cup holdersRound pedestal table w/ 2 cup holdersStern entry w/ heavy-duty boarding ladderHeavy-duty 9' Bimini top in choice of 3 colorsOPTIONAL FISHING FEATURES: Fish Station w/ livewell and optional ski tow; MotorGuide® or MinnKota™ trolling motor; Lowrance Elite or Mark-5x fishfinder Lowe factory packaged boats are available with various horsepower Mercury® outboards. Standard equipment and options may vary from model to model.